What is your idea of the perfect family vacation? Is it lounging poolside in the warm sun, being pampered at a world class spa, getting back to nature in the northwoods, or maybe a theme park adventure? Then why not try something completely different and exciting? How about vacationing at the Water Park Capital of the World? Why not … start planning your next family trip to Wisconsin Dells Water Parks! The Dells has a large variety of attractions that include lots of fun, as well as plenty of relaxation for a couple or family of all ages. It’s not just a place known for dairy cows and cheese. We are home to the most famous and largest water parks in the world. Here in the Wisconsin Dells you can brave the Anaconda, ride a Cyclone, tame Pegasus, relax on a winding lazy river, see adventures in the undersea world of Neptune, defy the wild rapids, then meet Zeus, all before breakfast. The Dells are a place so filled with jaw-dropping, pulse pounding excitement you may never want to leave. 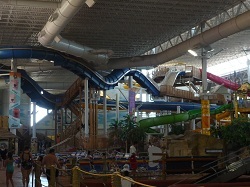 The many Wisconsin Dells water parks are indoor and climate controlled so you can play all summer or even in the coldest of winter days. Imagine plunging at 75 miles per hour down a near vertical slope in the middle of a snow storm without freezing to death. Chula Vista Resort: The Chula Vista Water Park Resort is the best of all worlds. The resort is set out in the tall pines along the banks of the Wisconsin River. 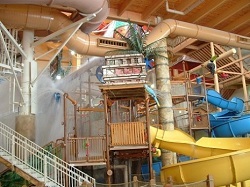 The resort has it all with the Spa del Sol, Cold Water Canyon golf course, a party barge along the Wisconsin River, comedy shows, games and arcade, and of course the Lost Rios indoor water park with 200,000 sq ft of indoor and outdoor thrills and chills. Great Wolf Wisconsin Dells Resort: The Great Wolf Wisconsin Dells water parks boasts 300,000 gallons of pure excitement with a total of 19 humungous waterslides, 6 pools one of which is a wave pool, a lazy river, a giant water fort, and so much more. Remember, all the water park activities are included with your overnight guest fees, so come visit a resort with “the rustic up north feel”. Kalahari Water Park: How about going on an “African Safari”. The Kalahari is known as the world’s largest indoor water park offering up a whopping 125,000 sq ft of indoor chills, spills and thrills with such awe inspiring and wild rides such as the Botswana Blast, an uphill water roller coaster called the Master Blaster, a funnel ride that spins you round and round before “flushing” you down the drain, Victoria Falls a family rafting experience, lazy river, tube rides, interactive children’s fort with spray stations, whirlpool spas, and of course the Flow Rider, a massive wave pool where you can ride a boogie or surf board for a real beach experience. Mt Olympus Wisconsin Dells: The very air of Mt Olympus Wisconsin Dells shimmers with power and the faint of heart run screaming for their mother’s. Do you have the courage and the convictions to stand upon the ground of the God’s and enter into their playground? 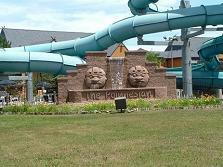 Mt Olympus is not one or two but a total of 4 huge water and theme parks in the Dells. 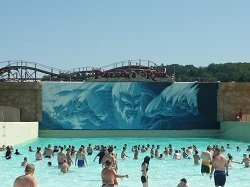 Mt.Olympus Wisconsin Dells is known as the largest indoor - outdoor theme water park in the area with 156 acre of fun and adventure for the whole family. 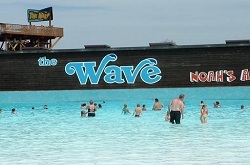 Ride the biggest roller coaster in the Dells or take the plunge at the Poseidon’s Rage wave pool with 9 ft rolling waves. Noahs Ark Wisconsin Dells: Known as the largest indoor water park in the world, Noah’s Ark is set on 70 acres and has a total of 80 spine tingling water park rides including 49 white knuckle water park slides. Check out the Black Anaconda while you are there’ it is the longest water slide in the world at a full ¼ mile in length. Polynesian Hotel Wisconsin Dells: With a total of 238,000 sq ft of both indoor and outdoor water park rides’ the Polynesian Resort is neither the largest or the smallest but is still one of the best. There are a total of 3 three story tall water slides for the brave and daring as well as story time and little tykes play areas for the youngest members of the family. And at the Polynesian kid’s under10 stay free!! 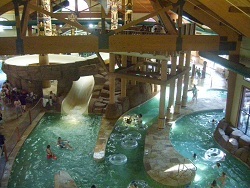 Wilderness Resort Wisconsin Dells: With 4 indoor water parks and 4 outdoor water parks set on over 600 acres, the Wilderness Hotel in Wisconsin Dells is considered to be the largest water park in America. The resort itself gives you the feel on being on vacation in the rustic northwoods. This resort also offers an 18 hole course golf course, Laser tag, Timberland Play Park, black light indoor golf courses, a huge arcade, mini golf, go-karts, plenty of restaurants, a zip line tour ride, and kiddy go-karts. The Wilderness Territory Resort Wisconsin Dells water parks are open all year round so you can enjoy the fun and exhilarating adventure of some of the wildest rides in the world. And the big attraction in the middle of winter is the 70,000 sq. ft. Wild Water Dome filled with wild rides and relaxing private poolside cabanas. When traveling to the Wisconsin Dells water parks to enjoy your vacation, you may want to know that with the exception of Mt. Olympus and the Kalahari, all the other parks in the Dells are a part of full resort complexes that are not actually open to the public, and are for guests only.